ClickFunnels is a sales funnel building tool which allows you to build high converting sales funnels. Actionetics is also one of the strongest marketing automation tools on the market which can dynamically filter customers as they proceed through the sales funnels. The Backpack affiliate management platform is ClickFunnels integrated system which allows vendors and product owners to setup an affiliate program for their joint venture partners quickly and easily. You’re able to process payments through ClickFunnels integrating with a suite of payment processors including Stripe, Braintree, ClickBank, JV Zoo, PayPal and many more. ClickFunnels also includes the ability to build fully functional webinar funnels and membership sales funnels. ClickFunnels is a very strong sales funnel tool for building out a webinar funnel. You’re able to add scarcity and urgency into your funnel by using timers and emails. One of the best ways to add urgency into your webinar funnel is by using emails at the right time. ClickFunnels action funnels allow you to follow up with prospects based on their interests and engagement in the sales funnel. When it comes to building membership funnels, ClickFunnels is extremely versatile in what you can do. You’re able to drip out content in your membership area as well as publish videos, PDFs, audio links and more. 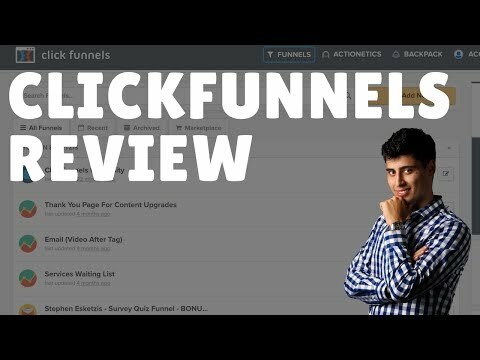 Between all the different types of media that you can publish in your membership site, ClickFunnels lets you publish it natively within ClickFunnels for a great user experience. When it comes to how ClickFunnels compares to its competitors like LeadPages, you begin to notice how different the two tools are. LeadPages is a great tool when you want to focus on strict lead generation, however when it comes to taking payments and selling products and services online ClickFunnels is the superior tool. Both ClickFunnels and Leadpages offer hosting including as part of paying for their monthly membership. Both programs are month to month and LeadPages offers a yearly option as well so you can pay either 1 year in advance or two years in advance. ClickFunnels has two tiers in their subscription program, the regular $97 per month plan and there is also the Etison Suite which includes ClickFunnels, Backpack as well as Actionetics. Meanwhile LeadPages is the same core product however has a few different features on each package. ClickFunnels and LeadPages both offer extensive follow up when it comes to mobile and text messaging marketing. If you’re building a sales funnel in ClickFunnels, you need to be focusing on mobile follow up notifications to keep your conversion rates high. The ClickFunnels sales funnel builder is one of the most powerful landing page builders on the market. It’s extremely flexible and allows for you to build elements, columns, rows and sections on any web page you like. Unlike the LeadPages landing page builder, you’re able to build and setup pages to either sell a product or stick to an optin funnel to acquire leads. ClickFunnels has many different types of conversion elements including evergreen countdown timers, order forms elements like order bumps, exit intent pop ups. When it comes to using ClickFunnels, there’s no initial setup fee. Nor is there an initial setup fee with LeadPages. All pages are completely mobile responsive and you’re also able to use upsell pages and downsell pages through all purchase sequences. ClickPops and LeadBoxes are available in both software companies. When it comes to tracking conversions, you’ve got the ability to drop conversion pixels through your sales funnel and same with the landing pages.